Although delta-9-tetreahydrocannabinol (THC)-induced elevations in accumbal dopamine levels are believed to play an important role in the abuse-related effects of cannabis, little direct evidence has been provided that the dopaminergic system is involved in the psychotropic effects of THC. The objective of this study is to investigate whether drugs activating or blocking the dopaminergic system modulate the discriminative effects of THC. 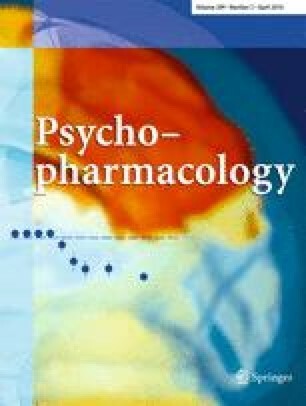 In rats that had learned to discriminate 3 mg/kg of THC from vehicle injections, the indirect dopaminergic agonists cocaine and amphetamine, the D1-receptor agonist SKF-38393, and the D2-receptor agonists quinpirole and apomorphine did not produce significant THC-like discriminative effects. However, both cocaine and amphetamine and D2-, but not the D1-, receptor agonists, augmented THC discrimination. Neither the D1-receptor antagonist SCH-23390 nor the D2-receptor antagonist raclopride reduced the discriminative effects of THC, even at doses that significantly depressed baseline operant responding. However, the D2-, but not the D1-, antagonist counteracted the augmentation of THC’s discriminative effects produced by cocaine and amphetamine. We hypothesized that release of anandamide by activation of D2 receptors was responsible for the observed augmentation of THC discrimination. This hypothesis was supported by two findings. First, the cannabinoid CB1-receptor antagonist rimonabant blocked quinpirole-induced augmentation of THC discrimination. Second, inhibition of anandamide degradation by blockade of fatty acid amide hydrolase augmented the THC-like effects of quinpirole. Dopamine does not play a major role in THC discrimination. However, activation of the dopaminergic system positively modulates the discriminative effects of THC, possibly through D2-induced elevations in brain levels of anandamide. This research was supported by the Centre National de la Recherche Scientifique (CNRS) and the University of Poitiers, France, and the Intramural Research Program of the National Institute on Drug Abuse, National Institutes of Health, Department of Health and Human Services, Baltimore, MD, USA.